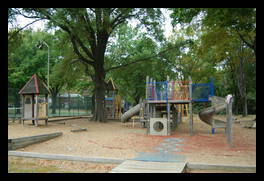 This large neighborhood park has a playground, tennis courts, a basketball courts, and ball fields. 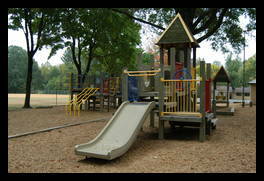 The playground is nice, It has swings, three different kinds of slides, and lots of things to climb on and play with. 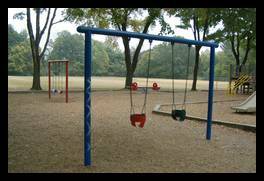 The play equipment is under several large trees, so it should be shaded even on the sunniest days. 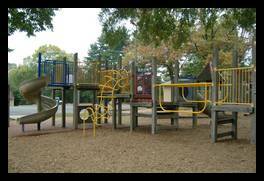 Most of the playground is mulch covered, but the very front has an area that is a solid and rubbery so at least part of the play area is accessible to disabled children. 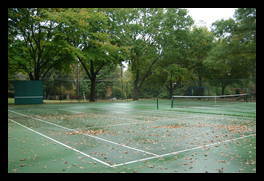 There are two lighted tennis courts and a practice wall. 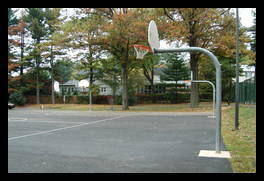 The basketball area has one court, but four hoops, so you could use it as four half-courts instead of a full court. 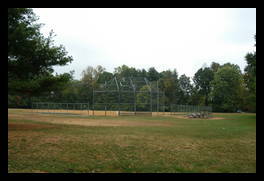 There are two baseball diamonds and a football/soccer field, however the football field overlaps the baseball diamonds. 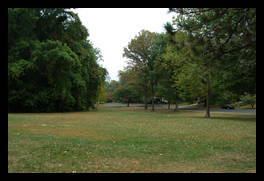 The front of the park has a large, semi-shaded grassy area. 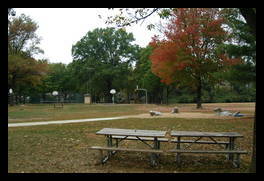 There is also a reasonably sized parking lot, a couple of picnic tables, and a water fountain there. There is a small recreation building you can rent, with bathrooms, however, it isn't air-conditioned. Facility Reservation Request Center. Typical of government sites, they don't make it easy. Tennis courts 2 ok One is in good condition, but the other one is missing a post that holds up the net so it is unusable. 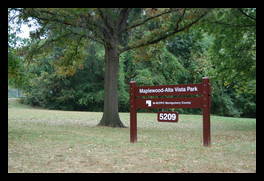 Montgomery County Department of Parks: Rentable Recreation buildings.